Lithuanian Talmudist and author of the nineteenth century; a native of Slonim, government of Grodno. Schick occupied himself especially with midrashic, or haggadic, literature. 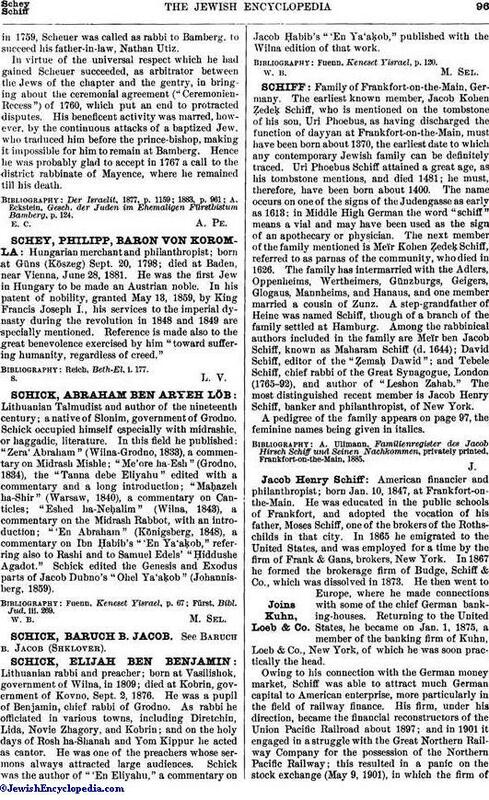 In this field he published: "Zera' Abraham" (Wilna-Grodno, 1833), a commentary on Midrash Mishle; "Me'ore ha-Esh" (Grodno, 1834), the "Tanna debe Eliyahu" edited with a commentary and a long introduction; "Maḥazeh ha-Shir" (Warsaw, 1840), a commentary on Canticles; "Eshed ha-Neḥalim" (Wilna, 1843), a commentary on the Midrash Rabbot, with an introduction; "'En Abraham" (Königsberg, 1848), a commentary on Ibn Ḥabib's "'En Ya'aḳob," referring also to Rashi and to Samuel Edels' "Ḥiddushe Agadot." Schick edited the Genesis and Exodus parts of Jacob Dubno's "Ohel Ya'aḳob" (Johannisberg, 1859). Fürst, Bibl. Jud. iii. 269.